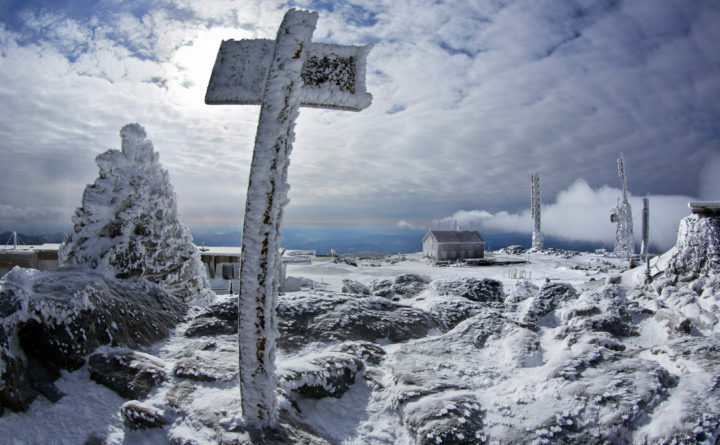 A sign marks the snow-caked summit of the 6,288-foot Mount Washington in New Hampshire, March 10, 2015. Meteorologists said a wind gust on Monday atop the mountain hit 171 mph, setting a record for the month which beat the previous February wind record of 166 mph set in 1972. It also was the strongest wind recorded there in any month since 1985. Mount Washington is known for having the “world’s worst weather,” and New England’s highest peak set a new wind speed record for February when gusts blew at 171 mph Monday evening. That broke the previous record for February set in 1972, when weather observers measured 166 mph winds, according to Krissy Fraser, events and marketing manager for the Mount Washington Observatory. The summit on Monday also experienced an average wind speed of 110 mph over a 24-hour period. The record for the all-time highest wind speed still is the 231 mph measured on the mountain’s summit on April 12, 1934.